Rowing at SACS has a long and illustrious history and tradition. SACS has had rowing in one form or another for the past 85 years and is still going strong. We have always had a relatively small number of oarsmen but have produced many outstanding results, in the Western Cape, Nationally and Internationally. Our oarsmen are very proud of the traditions and achievements of those before them and look to the present and the future in their training and planning. Rowing, by its very nature, demands discipline, planning, endless hours of training and strategising and this then produces a moment where the crew is able to make the boat move fast. This is one of the aspects that the oarsman lives for. This discipline, planning and strategising then manifests itself in every aspect of the oarsman’s life, even through to their school work. The rowing club caters to all age groups from the novice U 14 rower just learning the art of sculling, through to the open oarsman training with their crew for Schools Boatrace in Port Alfred. The junior U14 and U15 crews are taught to row in sculling boats (each rower has two sculling blades) from a single scull through to a double, a coxed quad and if there are enough oarsmen, a coxed octopul. U16 and open crews row sweep oar (each oarsman has one long blade and rows on the stroke (right) or bow (left) side of the boat) in pairs, coxed fours or the coxed eight. Those who want to are encouraged to continue to scull in the various boats too. SACS oarsmen have achieved high honours over the years with the 1st VIII having won the South African Junior Championships twice, the Buffalo and Selborne regattas and various other provincial and national competitions. A number of oarsman have gone on to represent the Western Cape and South Africa in national and international competitions. 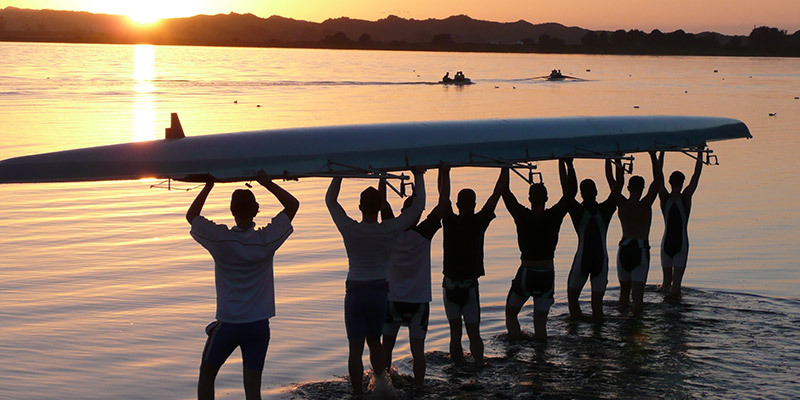 SACS crews train daily in preparation for local, provincial and national regattas including rowing at Elgin, Misverstand, Knysna, East London, Port Alfred and Roodeplaat Dam in Pretoria. Some years we also get to row at the Victoria and Alfred Waterfront. An exciting and rewarding sport with lots of tradition offered at an exciting and traditional school.